Trek through an unforgettable remote mountain route created by the ancient pilgrims that has remained unchanged by time. Here at 17,000 ft, you are completely embraced by the nature’s soul. We call it a Mountain Shower as it gives a once in a lifetime opportunity to feel our own soul and to cleanse our spirit that has long been swathed in the synthetic creation of modern lifestyle. Make the visit of Lhasa (the land of God) and its historical and sacred sites more meaningful with the opportunity to meet and interact with local people with a various backgrounds of lives, including families and friends of your tour leader. Rare opportunities like audience with a high spiritual teacher and private visit to hermits and nunneries will transform your travel experience into an unforgettable spiritual connection with the ancient culture of Tibet and its living people. While being on the Roof the World, you will be treated with an experience of visiting the Mt. Everest and its famous base camp at 17000 ft. Arrive and stay one night in Chengdu, the capital of Sichuan, in the Southwest of China. This is a city famous for its food, silk and massage. Nearby panda reserves, and the giant Buddha of Lu-Shan are just some of the many popular tourist sites. In Chengdu you will meet your companions for your journey and have a brief orientation that will cover some details of the trip and provide a brief introduction to Tibetan culture and customs. Fly to Lhasa. A breathtaking flight with spectacular views of majestic snow mountains and the giant rivers that cut through the Tibetan Plateau. After a two-hour flight, the plane begins its decent above the Yarlungtsangpo River (Brahmaputra) and lands in a valley about a 40 minute drive from Lhasa. Upon arrival in Lhasa, we drive through the modern city, and check-in to a Tibetan hotel within the traditional quarter, close to the Jokhang Temple. We have dinner in a rooftop restaurant with views of the Potala Palace, and there is further chance to explore and discuss Tibetan culture and customs. Visit Jokhang Temple. Built in the 7th century, the Jokhang is the spiritual heart of Tibetan Buddhism. Pilgrims from all over Tibet gather, walking with prayer beads and prayer wheels in their hands, focusing only on a good rebirth and achieving enlightenment. They add their offering of butter to each of the hundreds of giant butter lamps that light up the 30 chapels of the temple. Each of these chapels has different statues of Buddhas, deities, lamas and protectors that have been collected between 639 and 1959. The central chapel houses Jowo, a 2,500 year-old statue of the Buddha brought to Tibet 1,300 years ago, surrounded by priceless jewelry embedded in the pillars. Pilgrims touch their forehead on the knees of Jowo and pray for their heart’s desire. The walls are covered with murals depicting the history of Tibet and Buddhism, including the construction of the Jokhang Temple itself. After exploring the chapels and statues, we visit the roof of Jokhang from where we see thousands of pilgrims and residents of Lhasa circumambulating beneath us. We have lunch near the temple in a rooftop restaurant from where we further watch the pilgrims walking around the temple and hear their murmuring of mantras. The whole world here moves clockwise around the holiest Buddhist cathedral in Tibet, the Jokhang. Visit Chuzang Nunnery and meet the nuns, and attend their prayer assembly, and have tea with them. Then we hike down to the town and have lunch with a Tibetan family. 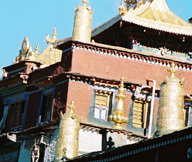 In the afternoon, we visit Sera Monastery, known as one of the three greatest monasteries in the country. Observe the monastic life while sharing tea with some monks in their old cell. Our visit of the temples include Tamdring Hall, where pilgrims get blessed by the deity of Tamdring that is believed to cure all sickness caused by negative spirits. We continue to the Great Prayer Hall where all the monks from both colleges of Sera Monastery gather for prayer sessions. Witness the spirit of Tibetan Buddhist philosophy through the dynamic debates between monks in the debating courtyard. Gain insight into Tibetan Buddhism through a privately arranged question – answer session with a Buddhist monk. In the evening we visit Tenzin’s family and experience a traditional Tibetan dinner with them. We drive to Shigatse. Traditionally known as the second biggest town in Tibet, next to Lhasa, Shigatse possesses Tashi Lhunpo monastery, built first by the Dalai Lama who later gave it to his then teacher, the Panchen Lama. Since then it became the home of Panchen Lama and one of the most important monasteries in the Gelugpa sect of Tibetan Buddhism. We spend one night in this town. Today, we visit the highest mountain on earth and one of the wonders of nature, Jomo Longma (Mt. Everest). We drive from Shigatse to base camp to experience the crown of the earth. Being here at 17,000 feet, helps us acclimate and prepare for the next 17,000 ft pass over which we will trek. We enjoy the beauty of Jomo Longma and see the sunset from the top of the world. We spend one night in a monastery guesthouse below the base camp. We drive back to Lhasa through a few scenic mountain passes and Lake Yamdrog Tso. Tonight, after we check in to our hotel, we have dinner on the rooftop restaurant of House of Shambala and rest below the calm horizons of the mountains that surround the holy city. 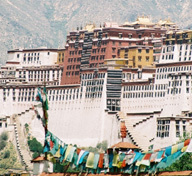 Today, we explore the landmark of Lhasa and the architectural wonder of the East. The Potala Palace is located on a hill called Marpori in the center of Lhasa. From the front, the structure begins at the foot of the hill. The palace with 13 stories, built entirely with mud and wood, has 1,000 famous chapels, gold-embossed tombs of past Dalai Lamas, one of which is called Zamling Yeshag (equivalent in value of the entire world) because of the amount of gold and precious gems this tomb contains. After lunch, we have solo time to rest and explore more of Lhasa city, and could get massage from blind Tibetan massage therapists who are some of the first graduates from the blind school in Lhasa established by Braille Without Borders. We leave the city and go into the wilderness of mountains. We drive alongside the Lhasa River and then up through a mountain road that leads to Ganden Monastery. We set up our tents on the green meadow where the famous incense-grass called Gaden Khenpa grows (only in this place) on the mountainside across from Ganden Monastery. We then visit one of the most important monasteries of the Gelugpa school of Tibetan Buddhism. This is where the founder of the Gelugpa, Je Tsongkapa who is often called the “Second Buddha” by his followers, built the first Gelugpa monastery. The temples we visit include one which holds the tomb of Je Tsongkapa, and the Throne of Ganden, Great Hall of Ganden Monastery, Ganden Tsogchen, where the monks perform prayers. Then we follow the traditional pilgrimage route around Ganden, known as Ganden kora, which takes about an hour. Along this circumambulation route, we will see the foot and handprints of Tsongkapa magically sunken into the stone and magical rocks that are believed to reveal the viewer’s future. We spend the afternoon acclimatizing – Ganden is at 4000m – and walk up to the hilltop where colorful prayer flags stretch along the ridge. We put up our own prayer flags there, with the names of those we love. 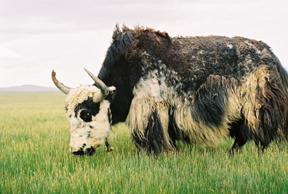 Tonight we meet our yaks and yakpas (yak boys), who will carry our bags for the next five days, and begin our immersion into the wilderness of Tibet. We have our first dinner on the mountain prepared by our Tibetan cook who will make breakfast, lunch and dinner during our trek. Trekking through scenic mountains of Tibet, we find ourselves in total tranquility. No roads with roaring cars. 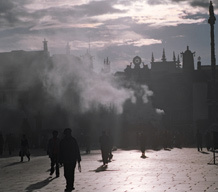 No sound of an alarm clock (leave yours in Lhasa!). Everything is as wild as nature created – we wake to the songs of mountain birds. At night the stars remind us how close to the sky we are sleeping. During the days the endless mountain peaks stretching below us make us realize how high on the earth we are walking. We cross several high passes, including two at 17,000 ft occasionally seeing nomads and a few villages. The trek ends at Samye Monastery, the first Buddhist monastery in Tibet, after riding a tractor for about an hour (the yaks are not allowed to go all the way to the end of trip). It was built in the 8th century by the Indian Buddhist master Guru Rinpoche. This is not only the oldest monastery in Tibet, but also a structurally unique monastery. The top floor is built in the Indian style, the second in Chinese style and the first in the Tibetan style. After visiting the monastery, we drive to Lhasa. We take hot showers and have a party for our last night in Tibet. Note: We have done this trek for four days in the past, but this time we decided to do it for five days as many people find is hard to do it in four days. 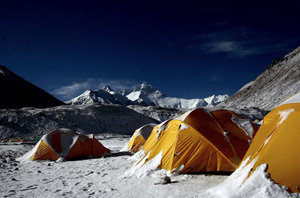 While the tranquility and beauty of nature is unforgettable, trekking in Tibet is not an easy activity for everyone. Part of the route of this trekking tour involves rough and rocky paths. One of the passes is 17,000 ft. But it gives a once in a lifetime opportunity to challenge one’s both physically and spiritually that can produce a new level of strength in one’s life.